Your BEMCC Membership card is one of the best investments you can make before entering Mexico! Please call us or visit our FAQs (Frequently Asked Questions) section and know how to use your card. Most people who travel to Mexico have a great time and don’t encounter any problems. However, as in other tourist destinations throughout the world, crime is a fact of life, and as a tourist you may be targeted for theft. 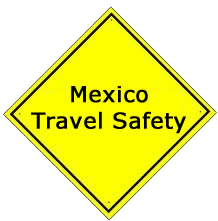 In order to increase your chances of having a safe and pleasant vacation, follow these tips for Mexico travel safety. As you’re packing, think twice about taking valuables with you. If they’re not essential, they’re probably better off left at home. This will also make for lighter bags, allowing you greater ease of movement which can deter potential thieves. Scan your passport and travel documents and e-mail them to yourself. That way, if your documents are lost or stolen you can easily access copies from your e-mail. Take your bank or credit card’s international telephone number with you (the 1-800 numbers used in the United States don’t work in Mexico). Leave a copy of your itinerary with someone at home, but don’t share details of your travel plans with others you meet while traveling. Credit or debit cards are the most convenient way to access your money while traveling, but losing your card (or having it swallowed by a cash machine) can be a great inconvenience, so have a back-up plan. Take some travelers checks (or a small amount of cash) just in case. Choose ATMs in malls or stores if possible. Avoid using ATMs at night or in deserted places. When you withdraw money from an ATM put it away immediately. Carry only the cash you need for the moment in your pocket or purse. Carry your passport, credit card and extra money inside your clothes in a money-belt, or leave them in your hotel’s safe. When you need to get something out of your money belt do it in a private place. Exercise particular caution when in crowds, markets or on public transportation. Pickpockets can be very crafty and sometimes work in pairs – one person will distract you while another takes your wallet. In Mexico you should avoid hailing cabs in the street. Ask your hotel to call a cab for you. They will take note of the number of the taxi and the driver’s name. At the airport and bus stations in Mexico City and other major cities there are official taxis (Taxis Autorizados) that you should take. Find out how to take an authorized taxi.